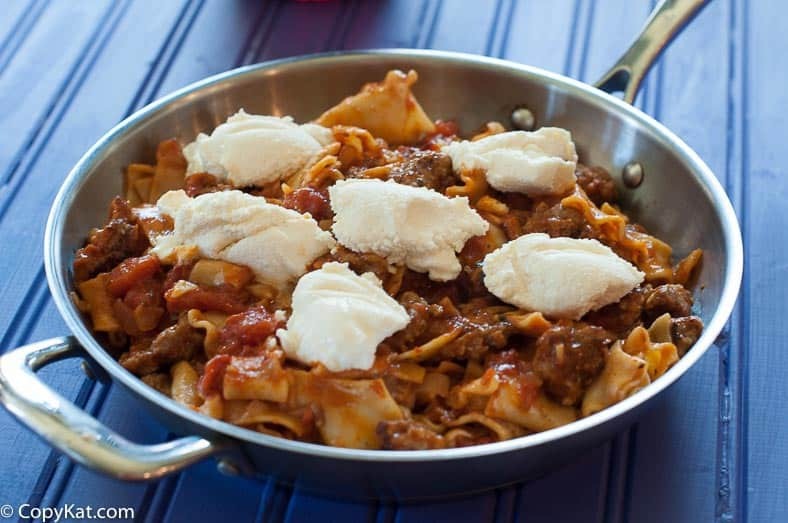 Skillet Lasagna is a great alternative to Hamburger Helper. Are you ever looking for an inexpensive meal to prepare on a weeknight? I know I am, and I have a solution for you. Recently some of my Youtube folks were looking for inexpensive meals to prepare, and I wanted to come up with a recipe that was inexpensive to make, but very hearty. I always enjoyed Hamburger Helper as a child, and I wanted to recreate this a favorite childhood recipe. While I do use leftover boxed lasagna noodles for this recipe, you really could use any type of pasta that you like. To help keep the costs down on the recipe I used Italian sausage, which is often on sale at my local Kroger store. I buy it fairly often at half the price of ground beef. I have also tried this recipe with just a half a pound of Italian sausage. For this recipe I use some fresh onions and some garlic. If you happen to have some bell peppers in your fridge, you could toss in one of those two if you like. This recipe if vary flexible. I use some ricotta cheese to add some flavor, if you like you could swap this out for cottage cheese, either one will work. I personally prefer the ricotta because I like the taste and texture more when the cheese is heated. Inexpensive meals do not have to be flavorless they can be both filling and delicious. cabbage roll casserole is filling and made with fresh cabbage, ground meat, and rice. Love Hamburger Helper? Try this Hamburger Stroganoff recipe. You can make a flavorful homemade hamburger helper in no time at all. In a large skillet brown meat, add chopped onion and chopped garlic to skillet. Cook over medium heat until the meat is no longer pink. Add tomato sauce, chopped tomatoes, 1 cup of water, Italian seasonings, salt, and pepper. Stir to combine.Break up pasta and toss into the skillet. Cook for approximately 15 to 20 minutes, or until the pasta cooks. If the liquid cooks out, you may need to add an additional 1/4 to 1//2 cup of water. Add ricotta cheese. Stir in cheese if desired. You can top with additional cheese. Hamburger Helper Lasagna was my favorite one by them when I as a child.. I can’t wait to try this!!! Oh, yeah, I remember that one. I also loved the stroganoff one. Do you plan to do any Cajun Dishes? Can’t wait to try the Lasagna dish! The “skillet” dinners were by Hunt’s and not Hamburger Helper. They came in a box with noodles, sauce and for the lasagna, a packet that had ricotta solids. Thanks for making at attempt at replicating Hunt’s Skillet Lasagna. I didn’t know Hunts had a similar product. I always knew this as a ‘Hamburger Helper’ product. I appreciate the knowledge! This looks delicious! 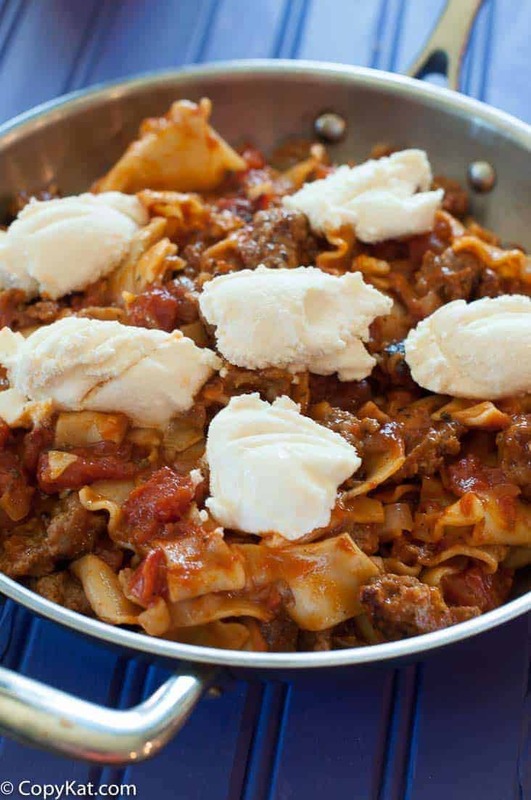 Did you use regular or oven ready lasagna noodles? I love lasagna and I do believe in using pork sausages too as it helps create a richer sauce as compared to ground beef. I generously added mozzarella, ricotta, and chopped basil for this too. Thanks for sharing. This seems like a good recipe that will be tasty and that the entire family will enjoy having. It is nice because there is lots of room for interpretation and creativity. I think those are the best recipes, where you can come up with your favorite additions to a recipe. This looks so yummy! I have been looking for new hamburger recipes. Thank you for this post. Good luck. Thank you very much. I think simple cooking is cooking at its best. You get to allow the natural flavors of the food to really shine. I hope you enjoy the recipe.